Broadband MP4 vietnamese_bb.mp4 (11.8MB), suitable for iPods and computer downloads. This clip sees Lindy struggling with her identity and sense of belonging. We learn that while she is happy to be found by her biological father, there are problems associated with this new relationship. Her adoptive parents, and Lindy, fear that Le will want to take her away from them as he had never signed the adoption papers. Lindy and Le meet for the first time at the airport. While he recognises her, she cannot remember him. As Lindy and her adoptive father settle Le into his accommodation, Lindy is torn between the two of them. The scene in the lift is evident of this; Lindy is positioned between her two fathers. In the swimming pool scene, Lindy and Julie discuss Lindy’s feelings about Lindy’s approaching first meeting with her biological Vietnamese father. What do we learn from Lindy’s words, and from the water imagery, about her situation and state of mind? The clip reveals that Julie’s family situation in Australia has some similarities with Lindy’s family situation. Explain why. Do you have anything in common with Lindy or Julie? If so, what are the commonalities? In the airport scene, we see a close-up shot of Lindy letting go of her adoptive father’s hand at a particular moment. What does this symbolise? Find a current web-news report of a family reunion at an Australian airport, which has come about because of a family separation or refugee situation. In pairs or small groups, share this report. Lindy’s adoptive father is honest with her Vietnamese father when he says he has mixed feelings about his visit. Is his honesty wise? Why? How do we see Lindy manage being with her two fathers who use two different names for her – Lindy and Mai? 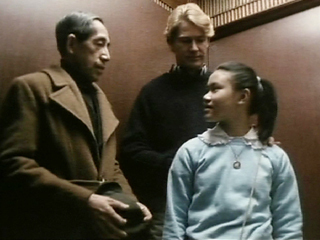 In the hotel lift scene Lindy asks her Vietnamese father about her birthday. What is his answer? What is her reaction? Quote from the dialogue in your response. What are the differences and similarities between Lindy’s two fathers? Consider their personalities, their life histories, their cultural identities and their attitudes to family. Show this in a Venn diagram. Doe we feel optimistic or pessimistic about the future of the relationship between the two men? What evidence is there for your opinion? Imagine if Lindy (Mai) had grown up in post-war Vietnam, instead of in Sydney. Research information about Ho Chi Minh City (Saigon). In 1975, this is the city where most Vietnamese adoptees were flown from to Australia. Find images of Ho Chi Minh’s nearby Mekong River settlements and the cities of Hue, Nha Trang or Da Nang to obtain similar visual information. Then, using images and text, imagine a place where Lindy was actually born. Label and describe the setting of Lindy’s likely home and streetscape – or riverscape – or coastalscape. Point out similarities and differences between her home in Sydney and her home in Vietnam.